Danielle Dal Cortivo is the co-founder of raize the roof, a volunteer-led organisation that helps children who are “a little less lucky” and CEO of Asthma Foundation ACT and Victoria. She is this week’s Changemaker. Asthma affects as many as 2.5 million Australians – around 11 per cent of the population – and kills 400 people a year. As head of Asthma Foundations ACT and Victoria, Dal Cortivo works to ensure the public understands the condition and fights for progress on treatment, education and one day a cure for asthma. 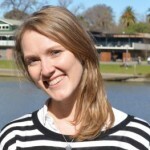 She has led the ACT organisation for three years, and took over leadership of the Victorian foundation earlier this year shortly after the thunderstorm asthma event in Melbourne. During her tenure, she has boosted funding for both foundations and expanded their services. In recognition of her contribution she was recently named Executive of the Year in the Canberra Women in Business awards. Prior to her role with Asthma Foundation, Dal Cortivo, also founded Canberra not for profit raize the roof which assists local children who are suffering from illness, as well as “children of the world” who are orphaned due to disease or circumstance. In this week’s Changemaker, Dal Cortivo talks about the importance of good leadership, improving the “sexiness” of asthma and how the thunderstorm asthma event in Melbourne served as a stark reminder of how lethal asthma can be. What attracted you to the not-for-profit sector? I co-founded a charity that started in 2009 when I was 25, so I guess I fell into the sector because I wanted to do something and contribute, and it seemed that the best way to do that was to start our own organisation. So at the time I was working in the public service in the Department of Health, and I just saw how [in the not-for-profit sector there was] much more flexibility and the opportunity for innovation and creativity and exploration of new ways of thinking and doing things, that I found very appealing. I was in the public service for about 11 years and it got to the point where the type of leadership I was seeking was very, very rare and when I really thought about who I am and who I wanted to be I realised that public service was just not the right fit for me so I just sort of stumbled into the not-for-profit sector after that and was very glad to have landed in here. You mentioned your decision was influenced by the type of leadership. What do you think makes a good leader? I think I am very attracted to visionary leaders, and leaders that can operate with freedom and that really challenge the status quo. I also like working in a really fast paced setting, so for me public service wasn’t really the right place for me. And I guess I had a look at what are the key qualities that I wanted in whatever role that I landed in and for me that was very much about being in a position where I could lead, being in a position where I could be creative and innovative and problem solve, deep and meaningful problems. But it is also really important for me to be able to empower others to really achieve and fulfil whatever it is that they’re looking for. So I probably didn’t know at the time that that was exactly what was missing for me in the public service but I knew that no one was really inspiring me and it’s not their fault but I wasn’t feeling very inspired. What does a typical day look like for you as CEO of Asthma Foundation ACT and Vic? Well I bounce out of bed and I go to the gym, I find that is great for just having a tiny bit of time out and then it depends on which state I am going to on what day. So, I am based in the ACT but I fly to Victoria every week. My days are at the moment incredibly colourful and it is never the same on any day and it is quite fast paced and disruptive. I work in a very disrupted way because things pop up that need to be addressed quickly so it can be very full on but it is very energising because you are engaged. At the moment I feel like I am engaged in so many really interesting projects and I find that really invigorates me in all the other areas of bits and pieces that I have to do that may not be quite as preferable, like writing board minutes and all that stuff. What are the organisation’s current priorities? So the big thing that we’re undertaking at the moment is a national merger. So I have been leading both Victoria and the ACT into that process and that is a really interesting process and has been a massive learning opportunity for me because you can plan for it and try to be as clear on exactly what it will all entail but it has been quite fascinating to watch how differently things unravel as we progress closer and closer to the merger. The other piece of work that I’m really, really interested in is we’re looking at repositioning asthma and where asthma sits in the scheme of chronic conditions and just its sexiness and its appeal to the community more broadly. So we’ve taken on a really creative process to really begin to un-piece where we’re at and what we think the future may be for people with asthma and our organisation now that we’re about to merge. So that for me provides an opportunity for real transformation and an opportunity to really – I know innovate is such a frustrating word that everyone is using – but to really define and start examining exactly what this organisation, what we can be achieving and what our role is and whether we need to venture into new waters, and that’s just a really exciting time for me I think. Do you think Australians are sufficiently aware of the symptoms of asthma? I think we’re in a really interesting position because I think people know that asthma exists but I think people are pretty complacent about it. It is just like “ah well, take your puffer and you’ll be right”, and there are all these different myths and beliefs, like “just don’t exercise if you’ve got asthma” or “I huff and puff a little bit but it’s not that bad”. And I’m not sure that it’s about awareness and education, I think asthma is very unsexy in the world of health conditions but the thing about asthma is it still is deadly and it also can have a really big impact on people’s lives, and sometimes people don’t realise they can be living a different life if their asthma was managed better. I think the the thunderstorm asthma event in Melbourne last year was a devastating, stark reminder of how asthma can be and it is really important that we all continue to remain very vigilant and mindful that asthma still can be lethal and it is still impacting millions of people every year. You took over leadership of the Victorian foundation earlier this year shortly after that thunderstorm asthma event in Melbourne, how common is it for asthma attacks to happen on that scale, is this a common phenomenon? There have been a history of thunderstorm asthma events in Australia and around the world, but the event in Melbourne was the most impactful, certainly in terms of data that has been collected on the thunderstorm. I think that it really is about a combination of factors that need to be at play for a thunderstorm to be as impactful as the one last year and so not every thunderstorm will cause the devastation that the thunderstorm did last year but I think going forward there is a chance that these storms may be more frequent particularly if we look at things like climate change and the impact of the climate on our pollen season and weather patterns and heat, and a whole lot of factors that contribute to the thunderstorm asthma events. Certainly we don’t want people to be frightened every time there’s a thunderstorm asthma event but it has really been a vessel for us to really encourage people to manage their asthma and allergies, because what we find is that if you manage your asthma and allergies, the likelihood of an event like that impacting and having such a devastating impact will hopefully be reduced. 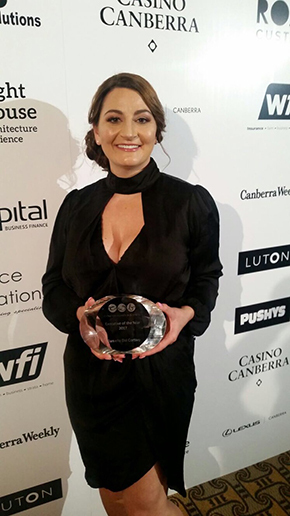 You were recently named Executive of the Year in the Canberra Women in Business awards, how does it feel to be recognised for the work you are doing? It is a difficult question to answer in some ways. I think for me, it is interesting to be acknowledged for what is just the way I live my life, so I feel so grateful and blessed to be able to have the opportunities that I have and be able to create the kind of life that I want that incorporates Asthma Foundation and of course raize the roof. What I hope the award achieves is that it shows other, particularly young leaders, that you just have to be really true to what it is that really matters to you and what kind of life you want, and when you take that on I guess you get a really fulfilling life. It all kinds of links in together. I think the award has also been awesome because it is a huge acknowledgement for the team that I work with and am involved with. I know that people always say but you’re the leader, and absolutely, but if I didn’t have such extraordinary volunteers that worked with me at raize the roof or such incredible teams that I get to be a part of and lead, I am only as successful as the incredible people that work with me. I hope that my staff and the volunteers realise that this award is as much theirs as it is mine. I am just the person who is at the front of the organisation. How do you find time for yourself? I love travelling, so I guess with raize the roof I’m lucky that I went to Botswana this year and I’m going back in a couple of weeks, with the Asthma Foundation I am presenting at a conference in America, so I am very excited to be able to go and do that over in America. I think I still make time for the things that really matter to me, so friends, exercise, family all of that jazz. But also I have really worked on trying to be more efficient and effective in my time so I don’t watch series’ and series’ of TV, some of those things don’t fulfil me as much as being able to contribute. So I’d love to say that I do yoga and meditate and do all of the things but I think I just try to have a life outside of work, full of things that inspire me and full of things that make me really stimulated and content. Wendy Williams is a journalist specialising in the not-for-profit sector and broader social economy. She has been the editor of Pro Bono News since 2018. Is the Health and Human Services Sector a House of Cards?